Here she heard the cries of her first three children, Dimitris, Andreas and her only daughter, Katerina, and here she watched them grow. 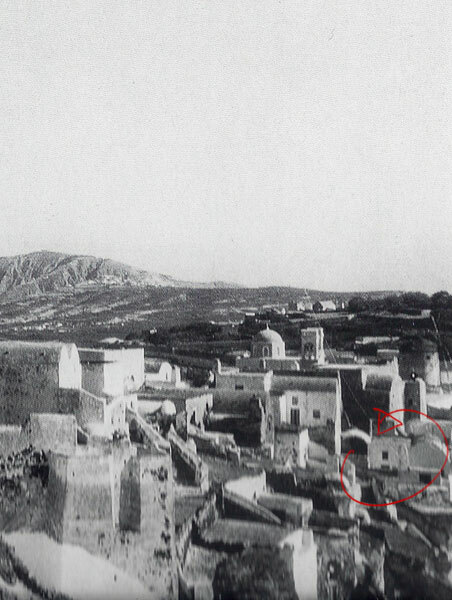 It remained her home until its devastation in 1956 by Santorini's last great earthquake. 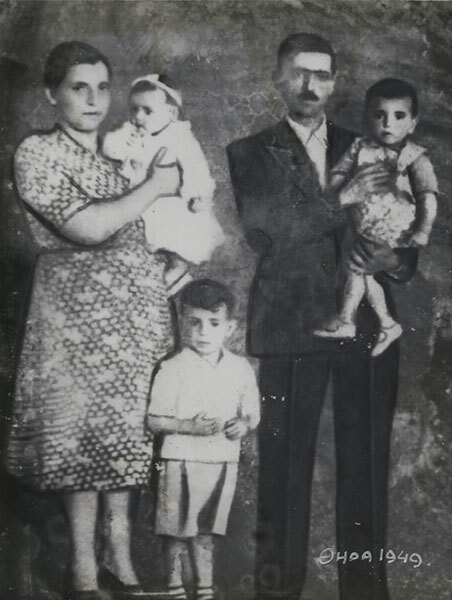 Grandma Smaro took the remains of her dowry, a few black and white photographs, and left the ruins of her home with her husband and children. During the earthquake of 1956 Smaro's house collapsed into ruins. Only a few things had survived. 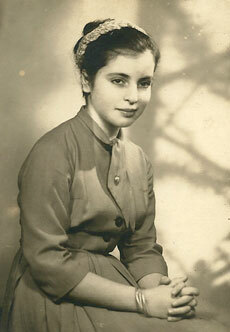 She gathered them up, and with her husband, children and memories of all the years she had lived there, she left. 1946 - The house that Grandma Smaro entered as a bride and raised her first 3 children, until the 1956 earthquake. 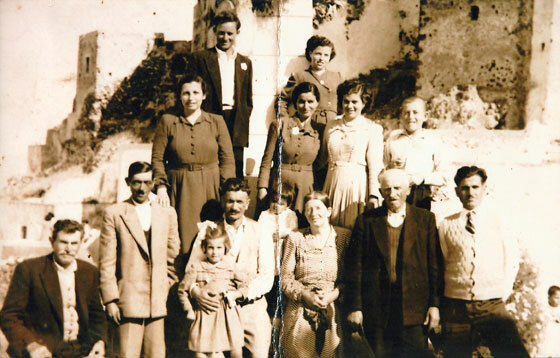 1946 - At the feast of the Holy Virgin of Malteza with her parents, Andreas and Katerina, and friends of the family. 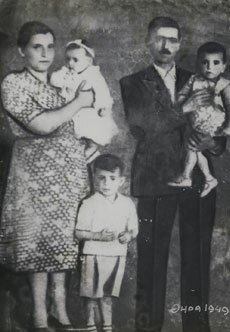 1949 The first family photograph. Smaro, her husband Artemis and the children. Katerina was just a infant. 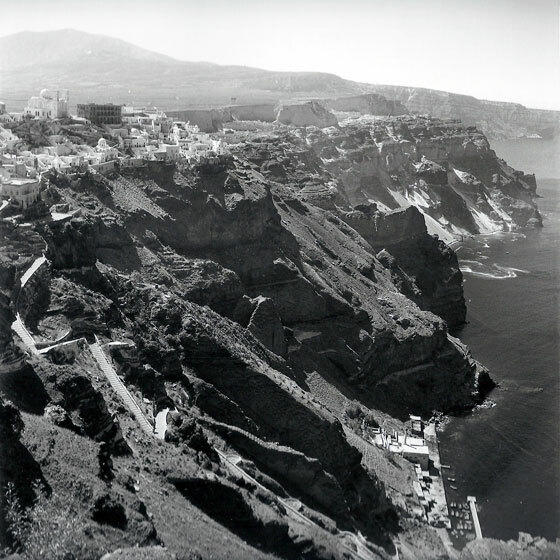 The volcanic eruption of 1950 and the earthquake of 1956 that followed were an economical and social catastrophe for Santorini. 85% of the island structures were destroyed and there was a large decrease in local population. 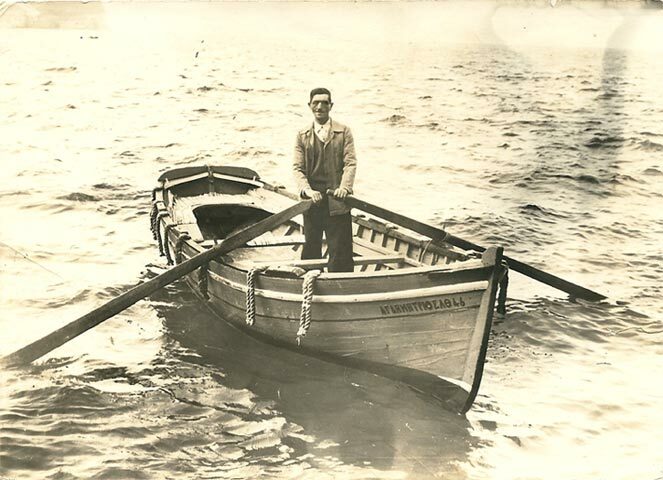 Photo : Robert A. McCabe. 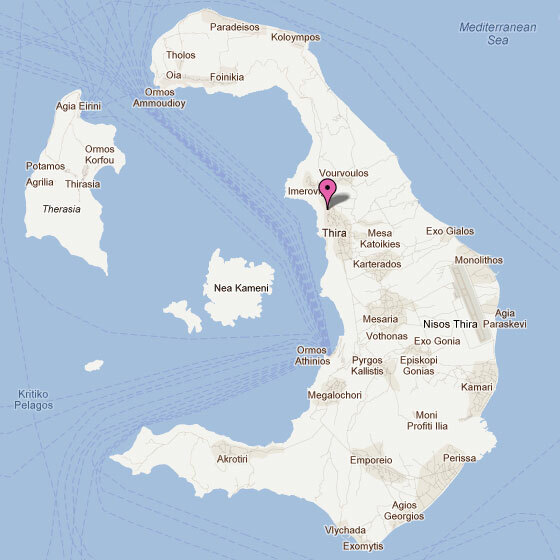 Map of Santorini with location of Smaro's house. 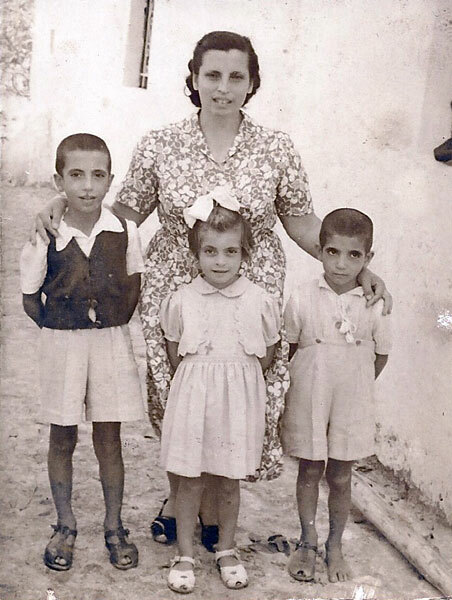 "My neighbours, the smells, the light - we were poor but happy within our community's embrace ..."
1949 The courtyard of the house that Grandma Smaro entered as a bride. 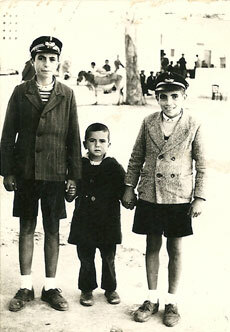 The children: Dimitris, Katerina & Andreas. 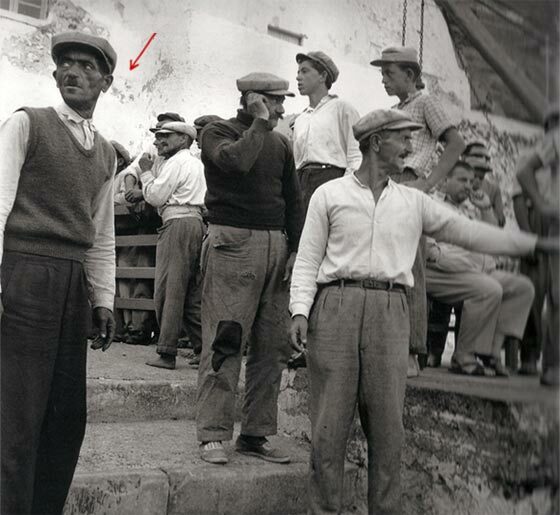 Artemis used to leave at the break of day and go down on foot to 'Gialos' (old port) in time to meet the 'postali'. 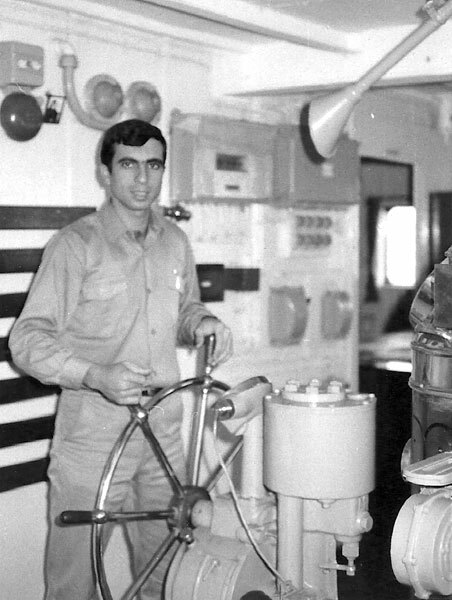 In those days the only thing on Artemis's mind was unloading the merchandise from the ships as quickly as possible. Endless hours under the burning sun, in the cold, and in stormy weather! 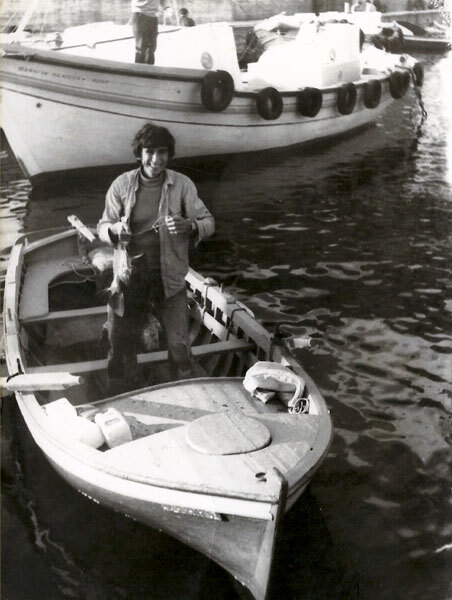 But his love and passion for the sea made him 'forget'. The only pleasure and brief respite from work was a cup of coffee shared with a friend at the local coffee shop down at the port, gazing out to the Aegean sea. 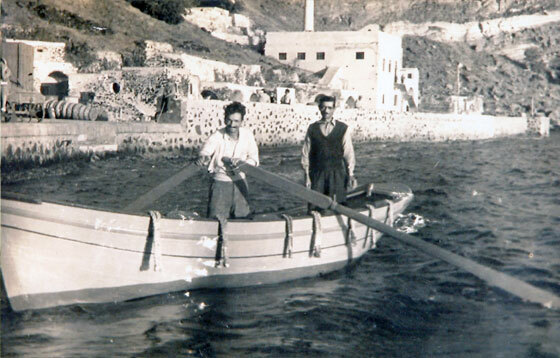 1955 - The Aegaion in the old port below Fira. 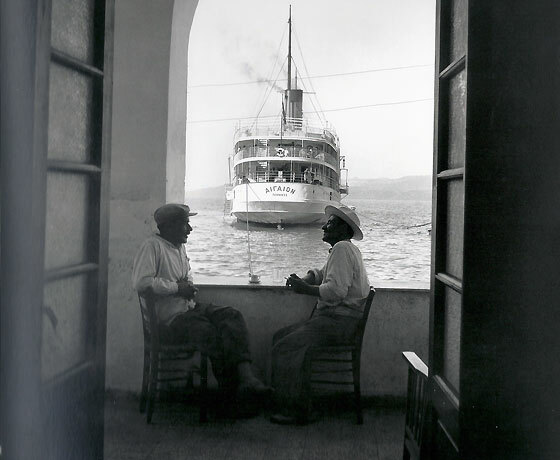 Photo : Robert A. McCabe. 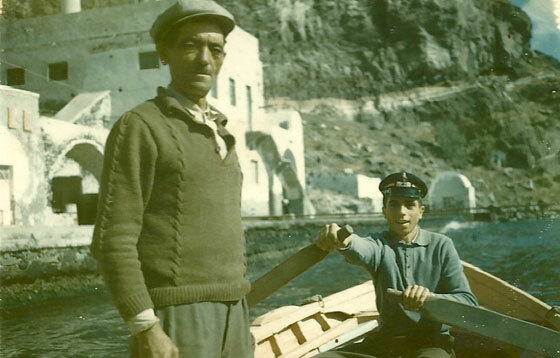 1955 - 'Gialos' (Old Port). 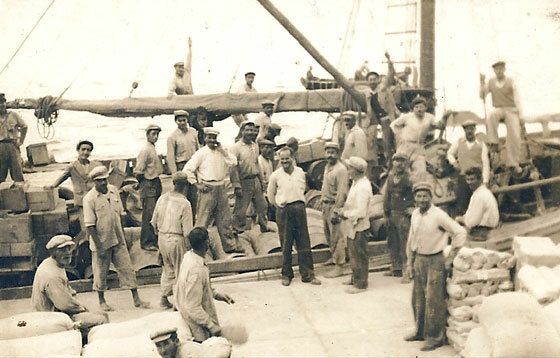 Unloading the merchandise at the docks. 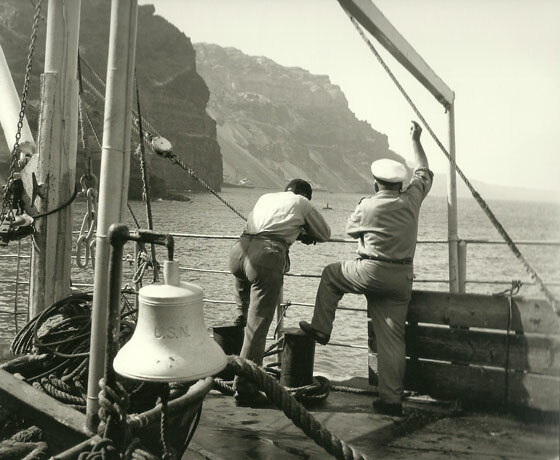 1955 - Maneuvering at the port of Fira. 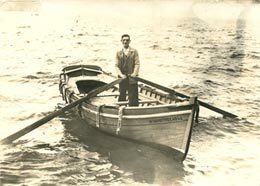 Photo : Robert A. McCabe. 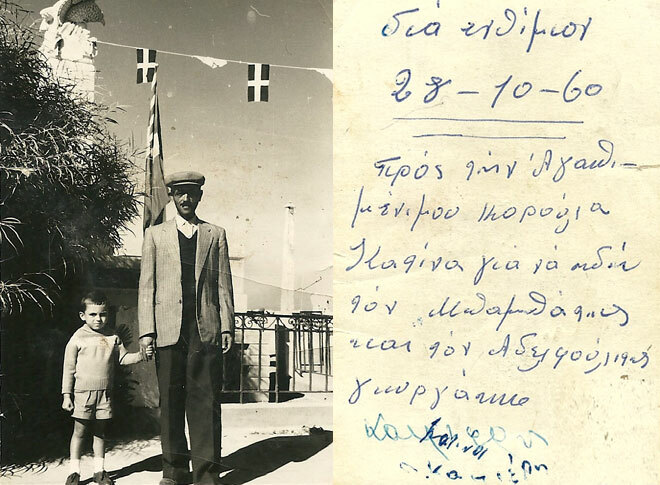 1954 The first commemorative photo of the firstborn son, Dimitris holding his 1st school report card. The earthquake was 7.9 on the richter scale. Fira, Firostefani and Oia were almost completely destroyed. There many casualties and some deaths. Exo Gonia and Mesa Gonia were abandoned, and the residents of those areas moved to Kamari. 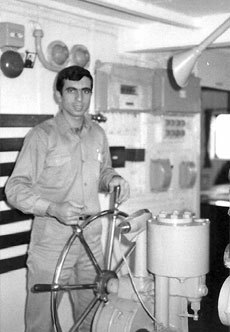 As a result of the disaster, and order to provide aid as quickly as possible, the military made emergency airdrops of tents, food & supplies. Fira & Firostefani 1 year before the earthquake. 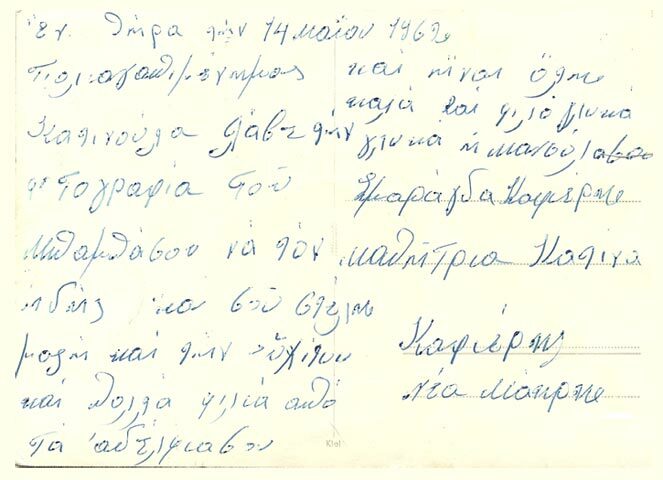 Inscription on the back of the photo to the right. 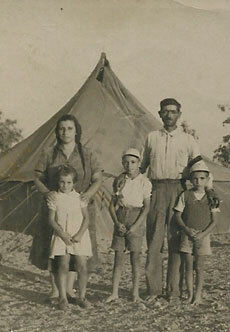 Earthquake victim camps were set up in Fira on the lower road. 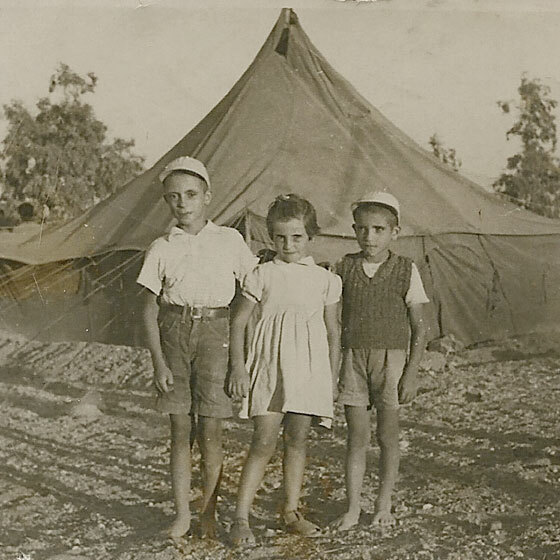 At that time the area was covered in trees and fields and the camps stretched as far as the eye can see. 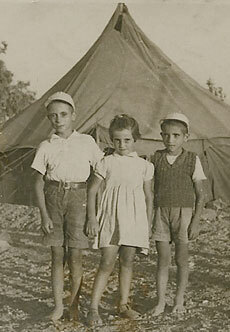 1956 The Aftermath Life in the camps for the earthquake victims. 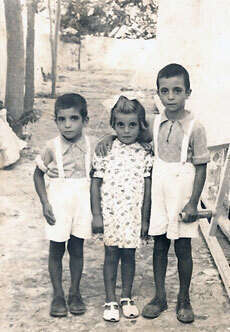 Left to right : Dimitris, Katerina & Andreas. The difficult years of the earthquake. Years full of deprivation and poverty. 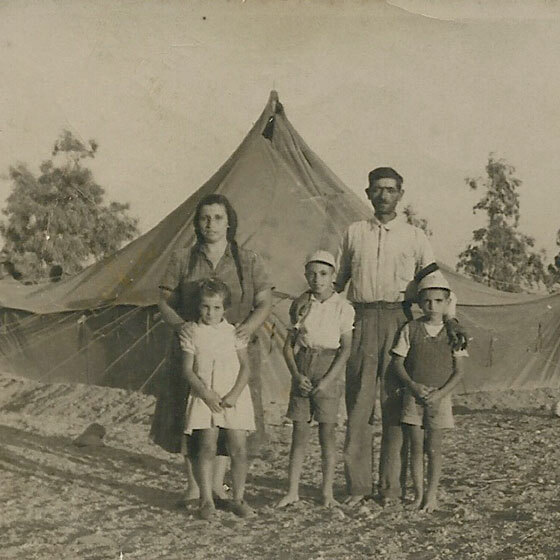 After 3 years in the camps, the family received government help & built a new house. Smaro lives there until this day. Leaving the island for the first time, Katerina travels to Athens to board with the nuns, visiting Santorini only for the summers. 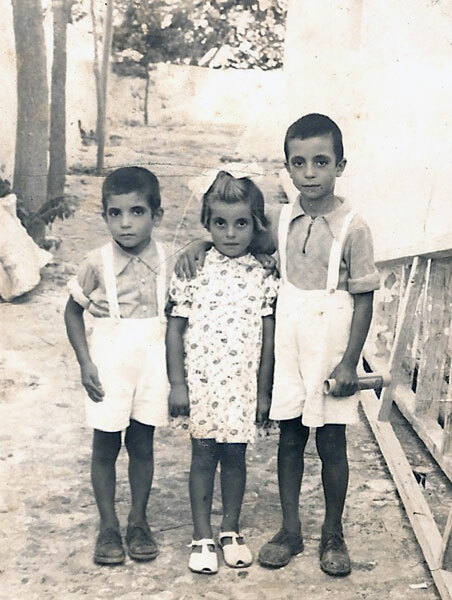 She spent her formative years growing up in Athens. Katerina finally returns to live in Santorini as a young adult in 1973. 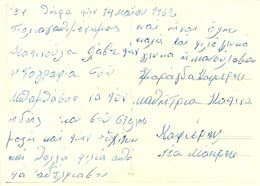 28th October 1960 - "For my beloved daughter Katina so that she can 'see' her dad and little brother Georgakis." The arrival of Georgos, the fourth and final child, sweetened the pain of being uprooted. 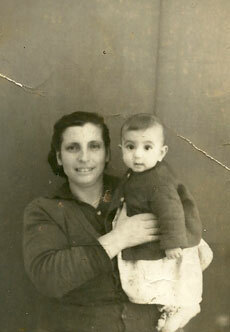 1957 The first photograph of baby Georgos in the loving arms of his mother Smaro. 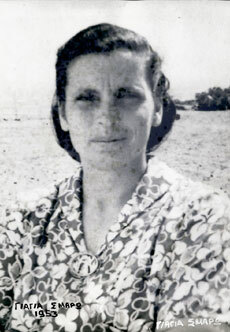 1957 Vouliagmeni Attiki Young Katerina on the beach in Vouliagmeni. Summers went spent in Santorini. Grandfather Artemis's image as a postcard! 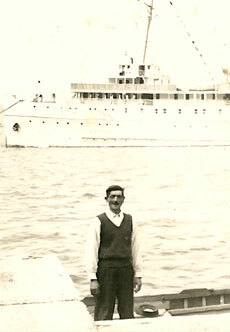 "To our darling Katinoula, receive the photograph of your papa so you can see him. He sends his blessings as well as many kisses from your brothers and says all is well". 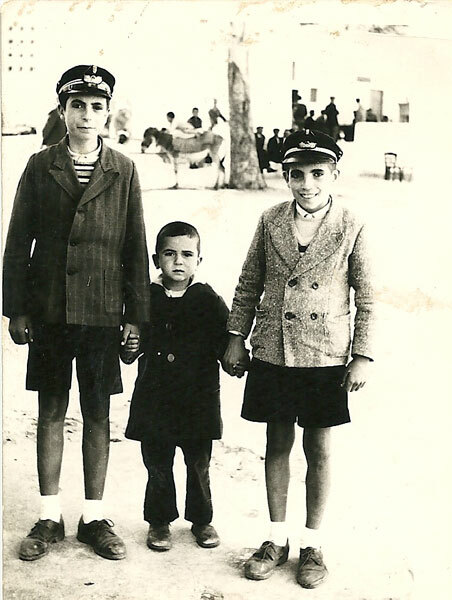 1962 "To our darling Katinoula ..."
7 May 1961 The 3 boys (left to right) Dimitris, Georgos and Andreas at the name day festival of Saint Fotini. 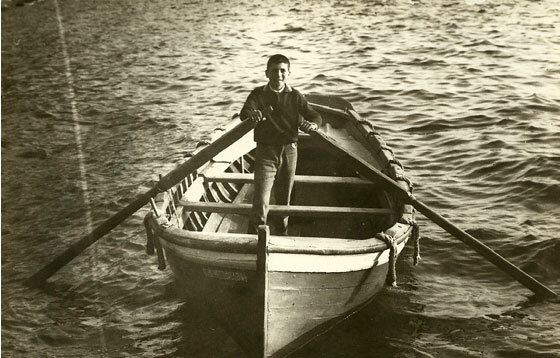 1969 - Giorgos at a younger age, proud to 'captain' his father's boat. 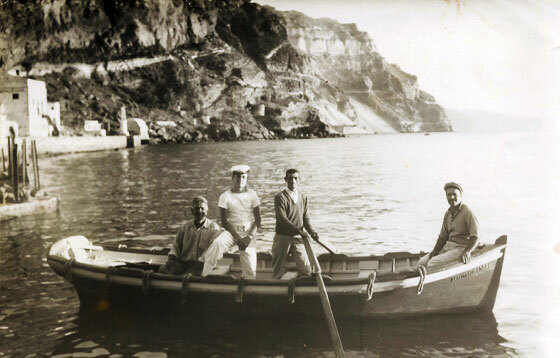 Ferrying passengers to and from the 'postali' was a way for Artemis to supplement the family's income. 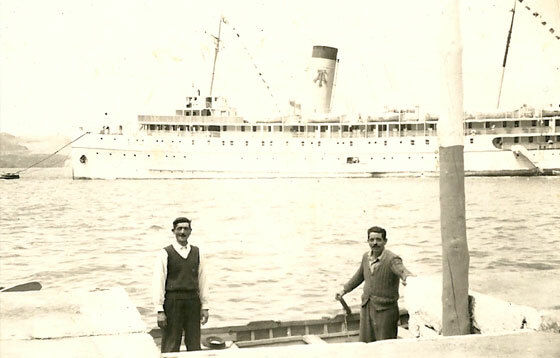 Dimitris and his father working at the port. 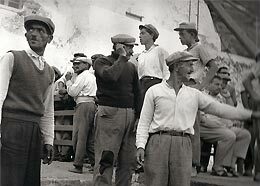 'Gialos' - A normal working day. Artemis and a friend. Artemis's great love for his boat and the sea was captured in the hearts of all his children. This love endures until today. 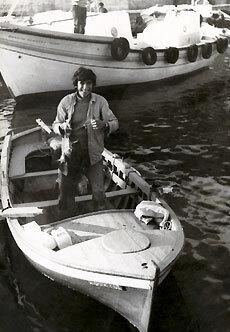 1976 Georgakis in his father's boat with the first catch of the day. 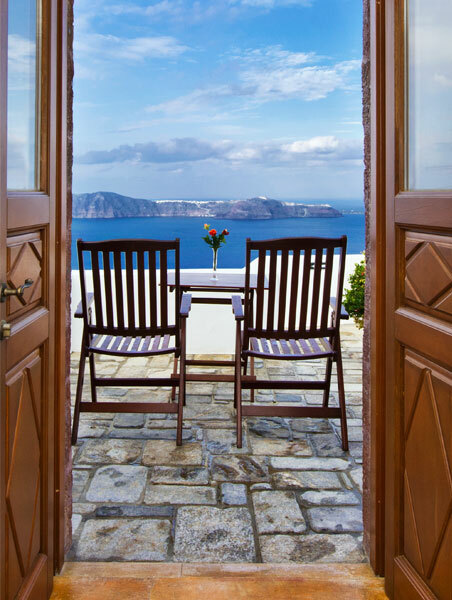 "... from my kitchen window I can see the volcano, the island of Thirasia, Skaros and the sea. 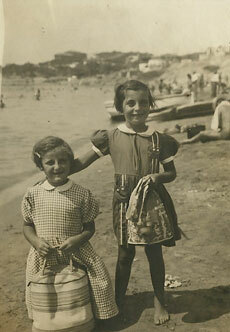 I can hear my four children playing in the courtyard - arguing, laughing, growing older". 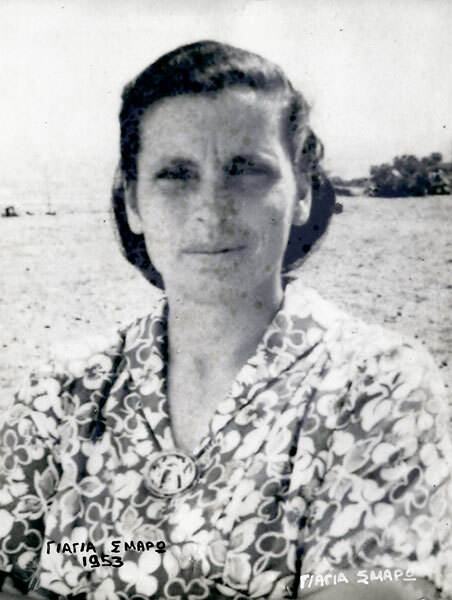 1953 Grandma Smaro on the beach in Perissa. 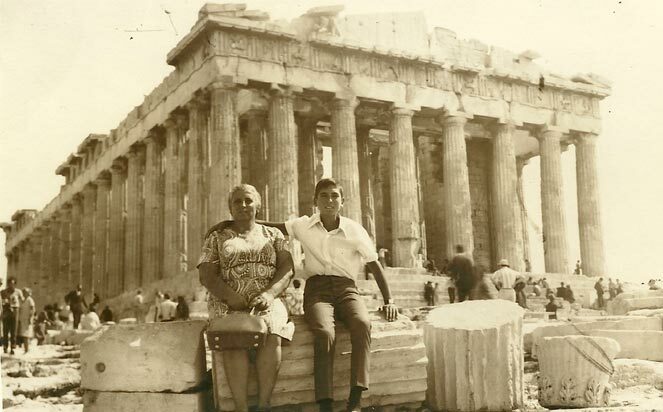 "I grow nostalgic for this time, for my children .."
Summer of 1973 : the first visit of George to the Acropolis and the final return of Katerina to the island. 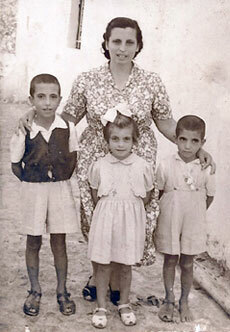 Grandma Smaro remains close and in a loving relationship with her children until today. 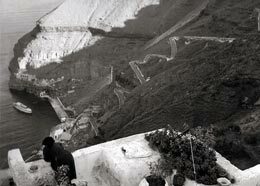 after the natural disasters of 1950 and 1956 at the end of the 1970's with the introduction of tourism. View of Fira from Firostefani. 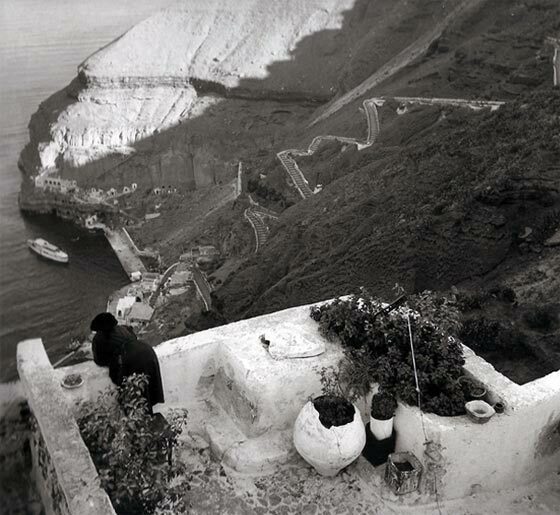 Santorini finally recovers from the earthquake with the introduction of tourism in the late 1970's. 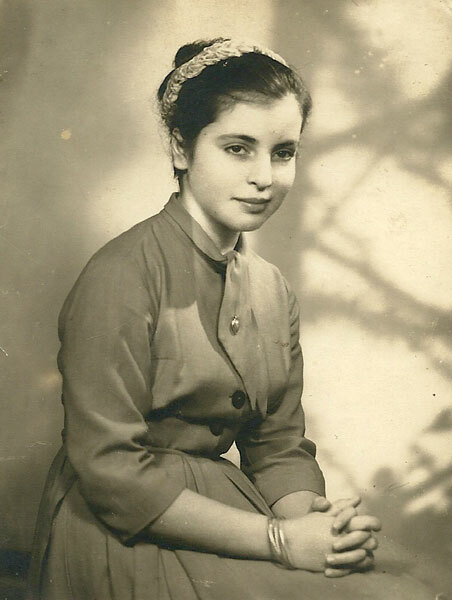 1973 Katerina as a young woman. 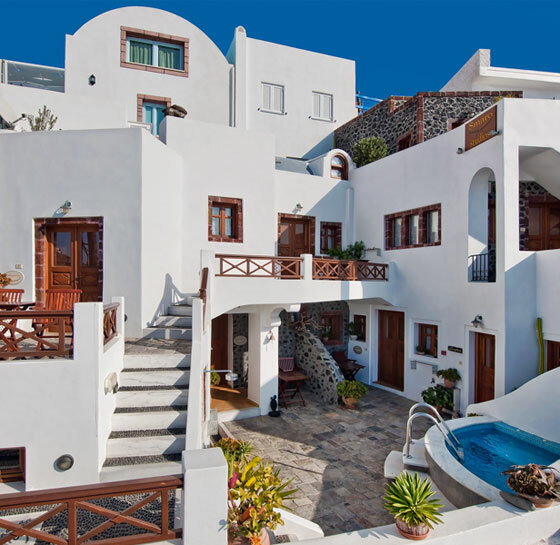 She returns to live in Santorini. 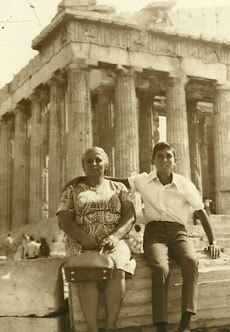 1973 Grandma Smaro and Georgos climb up to the Acropolis and visit the Parthenon. In 2000 the house was restored - six apartments were created, one for each member of the family, each decorated in the style of her era. 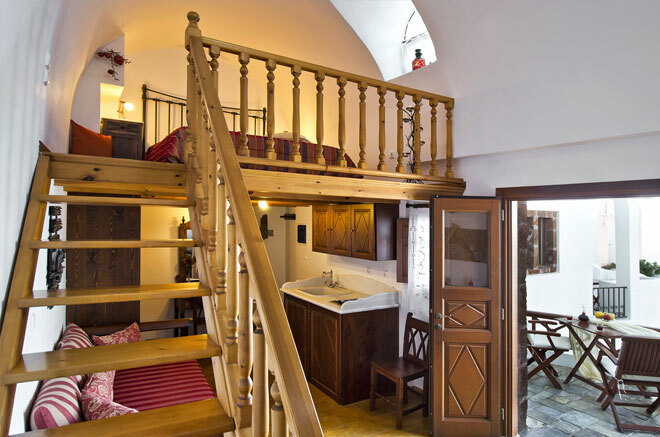 Grandma Smaro's cousin, Master Lefteris of Krikela created the furniture, and the courtyard and the balconies have been covered in stone, just as they used to be. Map of Santorini with location of Smaro Studios. The morning brings fresh eggs for breakfast, cakes, jams, toast & butter, juices and something hot to drink. The larder is filled with fruit, yoghurts, local syrup sweets, coffee and tea, milk and sugar, and tidbits of all kinds. Beautiful sunsets and view of the volcano from Smaro Studios. The apartment named after Grandma Smaro. All the apartments have been decorated in the style of that era. All the balconies are covered in stone and have a fantastic view. 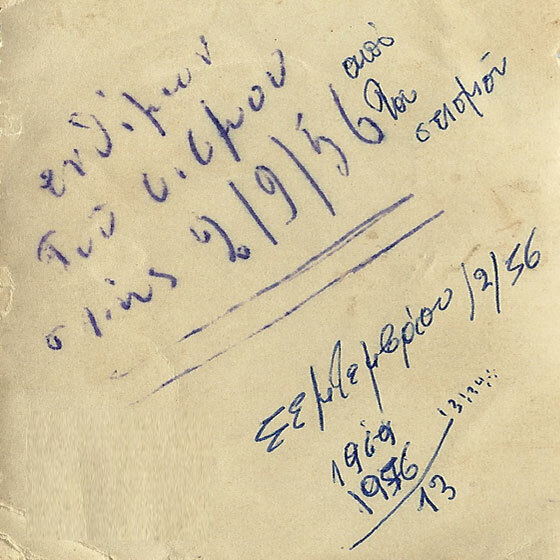 Robert A. McCabe "1954 - 1965 Images of An Enchanted Land"
The first time I visited Santorini in 1961 as a newly appointed Curator of Antiquities for the Cyclades, Thanasis Yannakas, the late lamented caretaker of the Museum welcomed me with the words, "If you are lucky, sir, there may be a little eruption for you to admire. It really is a marvelous sight". 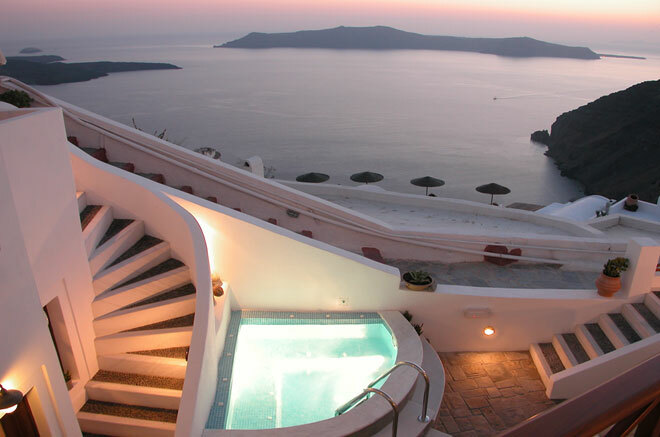 Santorini voted 2011 Top Island Destination. 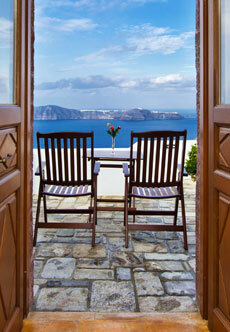 "Santorini is a new World's Best Island Overall winner, moving up from its No. 6 ranking on last year's list of Top Islands Overall and displacing the Galápagos from the No. 1 position." Santorini is a group of islands in the south Aegean sea: Thira, Thirassia, Aspronisi, the Christiana Islands, Palia Kameni, Nea Kameni (Volcano). 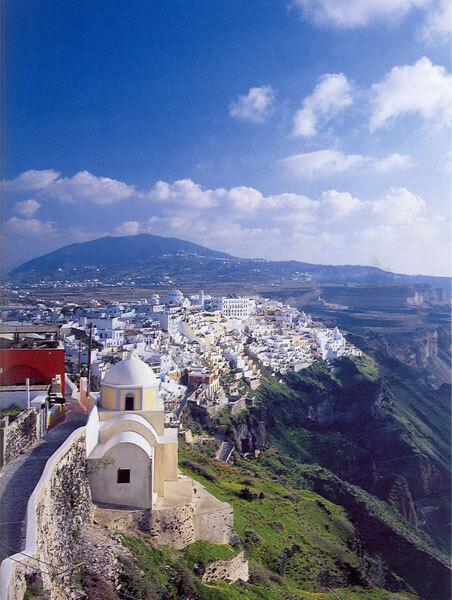 The Province of Thira is made up of Santorini, Anafi, Thirassia, Ios, Folegandros and Sikinos. Cave Houses, neo classical mansions, cobbled streets, winding paths, domed churches, most houses have a dome at some part of the roof structure. 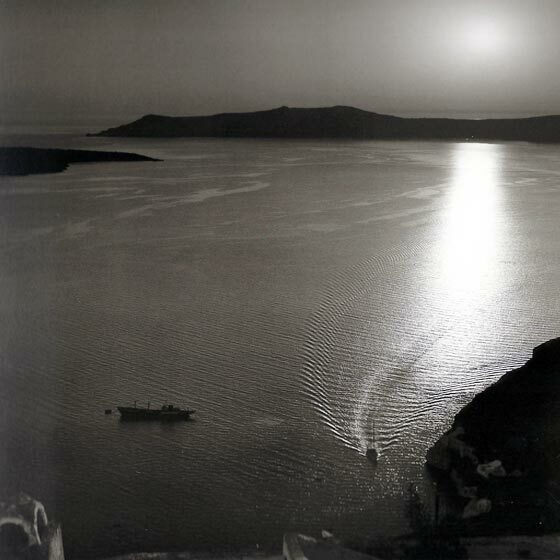 Latitude - 36 19’ 56” to 36 28’ 40” N., Longitude - 25 19’ 22” to 25 29’ 13” E.
Boats depart from Piraeus all year round. During the summer season hydrofoils also leave from Piraeus, as well as connections from Crete & other islands. Direct flights from Athens International Airport are available all year round.